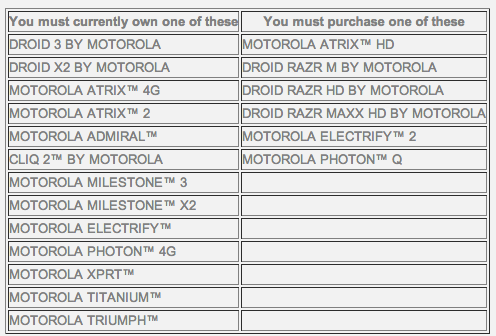 Motorola dished out a list of smartphones that will not be getting the Jelly Bean Update for their Android OS. 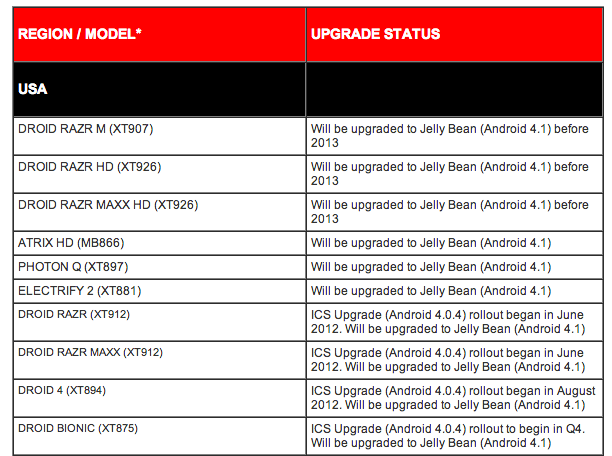 A list of devices that will be getting the Jelly bean Update in the near future was also seen. To make the news a little less painful for its customers, Motorola will offer a $100 Credit for the customers who would like to trade a phone that will not get a Jelly Bean Update with a phone that WILL GET a Jelly bean Update. The lists were released today and it wasn't a shock as Motorola had announced during its keynote event that it will release Jelly bean update for phones by the end of this year and a $100 credit will be given to those who wan to trade a WITHOUT UPDATE Phone for a WITH UPDATE PHONE. THIS OFFER IS ONLY LIMITED FOR US AND CREDIT WILL BE PROVIDED IN THE FORM OF A VERIZON WIRELESS GIFT CARD, MOTOROLA VISA PREPAID CARD, CARRIER CREDIT, OR OTHER EQUIVALENT AT MOTOROLA’S SOLE DISCRETION. It is good news for those who were planning to replace their old Motorola Device with the Droid Razr, Droid Razr HD or Razr Maxx HD. Others users who were in love with their Motorola device like the Photon 4G, its a disappointment. With Samsung already rolling out updates of Jelly Bean for its flagship phone Galaxy S3, Motorola also needs to get the updates out in order to keep their sales steady. Google Owned Smartphone manufacturers need to focus more on Customer Service and Satisfaction. Releasing phones with large batteries and less bezel might get them some sales but it’s the after-sales service that keeps customers loyal. Are you Angry at Motorola?.. Please share your views with us!